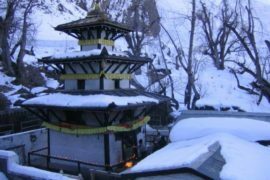 Within Hinduism,Muktinath Temple is called the sacred place Mukti Kshetra, which literally means the “place of liberation or moksha”. This temple is considered to be the 105th among the available 108 Divya Desam, which are considered sacred by the Sri Vaishnava sect. The ancient name of this place in Sri Vaishnava literature, before Buddhist origin, is Thiru Saligramam. This houses the Saligrama shila considered to be the naturally available form of Sriman Narayana the Hindu Godhead. It is also one of the 51 Shakti peethams.The Buddhists call it Chumig Gyatsa, which in Tibetan means ‘Hundred Waters’. Although the temple is has a Vaishnava origin, it is also revered in Buddhism. For Tibetan Buddhists, Muktinath-Chumig Gyatsa is a very important place of Dakinis, goddesses known as Sky Dancers and one of the 24 Tantric places. They understand the murti to be a manifestation of Avalokitesvara.